Beautiful RARE engraved Convertible Debenture Specimen Certificate from the Phelps Dodge Corporation dated in 1937. 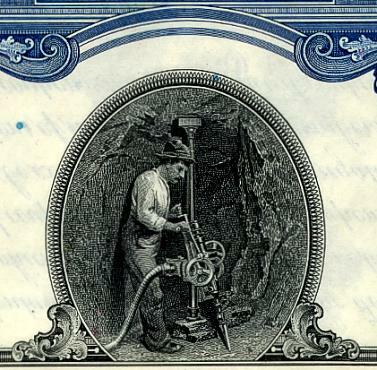 This historic document was printed by American Bank Note Company and has an ornate border around it with a vignette of a man working in a mine. This item is over 80 years old. 30 coupons attached on right side. This is the first time we have had this for sale and we only have one. 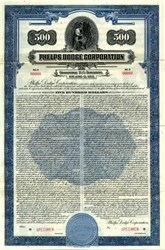 Phelps Dodge Corporation NYSE: PD was founded in 1834 by Anson Greene Phelps and William E. Dodge. Initially, the company operated an import-export trade business that shipped U.S.-grown cotton to England in exchange for tin, iron, copper and other metals essential for growth and development of the new American nation. As time went on, the company began its own mining operations as the western United States frontier expanded, and its mineral wealth, especially copper, started being discovered. The company focused largely on providing copper wire and cables to industry that became in high demand as the Industrial Revolution took hold. As the company diversified, it began investing in new railroads, essential in the company�s efforts to establish itself in the west, especially copper-rich Arizona, and to transport products to and from its markets on the eastern/northeastern shores. During the late 19th century, in concert with its metal interests, Phelps Dodge Corporation became one of the largest producers of lumber and lumber products in the United States. Today, Phelps Dodge Corporation has large copper mining operations in Bagdad, Arizona, Morenci, Arizona, Sierrita, Arizona, Miami, Arizona, and Tyrone, New Mexico, and at the El Chino Mine in New Mexico. Several of these locations are providing ores rich in molybdenum as well. Presently, Phelps Dodge Corporation is initiating all required local and federal processes to open a new mine located near Safford, Arizona, and is expected to employ approximately 350 people. In South America, the company has several very large copper mining operations going on in Chile and Peru. In Congo, Phelps Dodge Corporation is the majority owner and operator of the Tenke Fungurume project, which is generally considered to be the world's largest undeveloped copper/cobalt project. The company employs more than 13,500 people worldwide. On Sunday, November 19, 2006, Freeport-McMoRan announced that it would acquire Phelps Dodge for $25.9 billion in cash and stock to create the world's largest publicly traded copper mining company.